Prince William's full name is Prince William Arthur Philip Louis of Wales. 2 Bihar Prabha, "The Mystery behind Eliza Kewark and her Linkage to India", (accessed 07/06/2013). 3 Connecticut Society of Genealogists, The Connecticut Nutmegger, 2000, Vol. 33, Page 18, New England Historic Genealogical Society (Online Database). 4 Evans, Richard K., The Ancestry of Diana, Princess of Wales , Boston: New England Historic Genealogical Society (2007), 1. 5 Rietwiesner, William Addams, comp. and Christopher Challender Child, et. al., The Ancestry of Catherine Middleton , Boston, Massachusetts: New England Historic Genealogical Society (2011), 4, 111. 6 Roberts, Gary Boyd, The Royal Descents of 600 Immigrants to the American Colonies or the United States , Baltimore: Genealogical Publishing Co. (2008), 578. 9 The Guardian, "Monarchs, Murdochs and Middletons: the DNA of Dynasties", (accessed 07/06/2013). 10 The Official Website of The British Monarchy, "House of Windsor Family Tree", (accessed 11/30/2012). 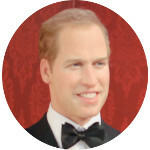 11 Wikipedia, "Prince William of Wales", (accessed 03/31/2011).